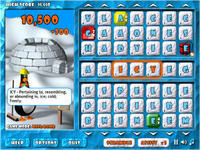 Icy Spell is a puzzler that combines gameplay elements from Sega's Lose Your Marbles and Boggle. Line up alphabets in the center row to make valid words, using your mouse to slide the letters up or down. Fairies is a new color matching game from FunPause, the developer of Atlantis. 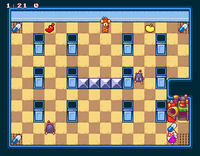 Slide rows of colored objects to create a match of three or more and complete the quota of each level. Completing stages will unlock extras, which comes in the form of beautifully painted images. It's not very imaginative by a long stretch and doesn't introduce anything new to a crowded puzzle subgenre but Fairies is an excellent example of how a good matching game should look like. Gameplay is a lot like Chuzzle Gold. 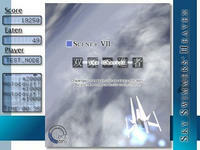 Graphics, sound and special effects is practically in the same class as Wik and the Fable of Souls. Finally, a game by Hamumu that isn't dumb! Technically speaking, some puzzle-solving skills are required to play this one. I wasn't really implying that Hamumu's games are dumb. They're absolutely brilliant. Anyway, Dumb: The Game is a collection of puzzles that you can solve online. A little like those IQ tests that everyone has done before. You get to boast your puzzle-solving abilities (or lack of it) by having your Dumbness Quotient (DQ) posted on the World Rankings page. Clannada is another shooter from Japan that showcases great 2D graphics and excellent controls, although the selection of enemies are a bit weird. In the game, you get to shoot at birthday hats, slime, playing cards and cookies to name a few. Blobs from the Puyo Puyo series also make special guest appearances. The option can be locked into certain shooting positions around your character by holding down the primary shot button. You can concentrate your firepower on one focal point for those sticky boss battles or spread your firepower to cover a larger area and take on more of the generic hostile units. Demo features two levels only. Direct download link here. 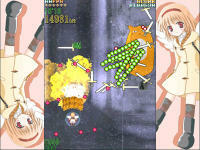 Hisyo Ayu is the prequel to Clannada, a shooter with oversized everyday items as your adversaries. Take on all sorts of sundry goods such as clocks, trees, swords, jars with mysterious contents, ducks, panda bears, cute furry creatures and more. Controls are limited to directional keys, primary and secondary shot buttons. Smartbombs can be replenished by collecting hyper items dropped by vanquished enemies. When used, it clears bullets from a certain section of the playing area and doubles your firepower damage for a short while. Bullets come thick and fast, especially near the end of the second stage. There's not much dodging that can be done, but fortunately hyper items are readily available in abundance. The first boss is a generic green frog, and the second one is probably the biggest bun I've seen in a shmup. Plays a lot like a Psikyo shooter. Demo features two levels only. Direct download link here and here. 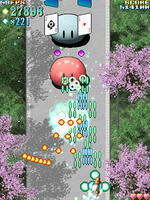 AirRade Air is a shooter from Japan that features extremely cute sprites for enemies and lots of eggs. Seems to be a lot of secret characters in this title. 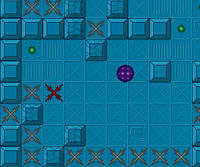 Alien Shooter is a great action game by Sigma Team in which your mission to infiltrate a base overtaken by alien hordes. The fear of being overwhelmed by unrelenting assailants is recreated faithfully here. Stock up on your firepower at the beginning of each level, as shortage of ammunition will happen frequently should you venture ahead unprepared. 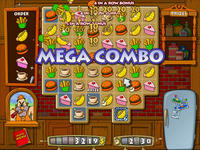 Bistro Stars is another matching game that features clean graphics and decent gameplay. The objective is to line up three or more similar items and highlighting every square in each level. There a memory mini-game in it as well. 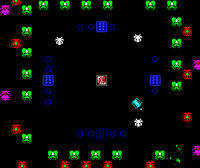 Ambush in Sector 9 is another Robotron clone by Chris Roper, but this time the story is set in space. Some additional features include collectible power-ups and an online high score table that you can submit a record of your best effort to. 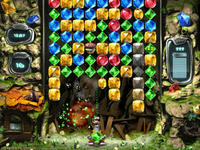 Diamond Drop by OXXO Media is basically a remake of the classic Magical Drop series, a popular puzzle game in Japan. The controls are simple, left click to pick up a row of colored gems and right click to put it back into the stack. You can only pick up gems of the same color at any one time. 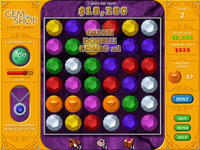 Create a row of gems numbering three or more to eliminate it and all adjacent gems of the same color as well. 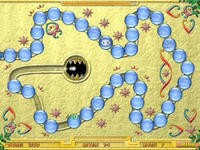 Ameoba is a nice variation of the popular Snake mini-game that can be played on any Flash-enabled browser. 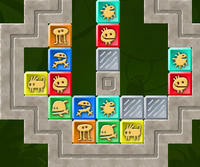 You control said ameoba using the arrow keys, collecting glucose cells and avoiding green-colored viruses. There's plenty of other classic remakes on the site as well. Soll Dega is a decent shooter from Japan that uses sprites similar to those found back in the days when 8-bit consoles were popular. 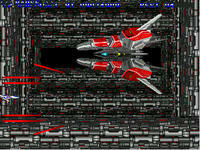 It plays well although the game may not attract many fans of the genre due to the popularity of manic shmups lately. Quite finicky when it comes to installation. When running the executable, you have to choose a location for the files to be copied. Download link is at the bottom of the page. 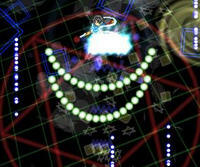 In Arena Runner, your task is to activate all the circles in each level to advance to the next. 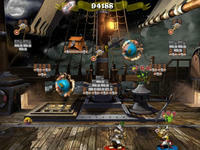 Turrets will attempt to shoot you down while you navigate your way through some devious traps and contraptions. PuffBOMB is basically a simplified version of Jeff Tunnell's The Incredible Machine, where all the gadgets have been replaced with bombs. 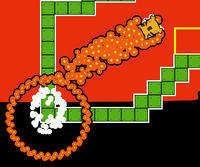 In it, you have to propel a hamster to the exit area by proper placement of highly combustible explosives. Brix Quest is a decent Tetris clone by Fenomen Games that features a two-player mode using the same keyboard. 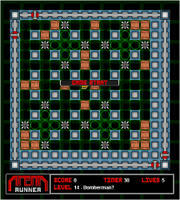 Quest mode consists of completing objectives of each stage to proceed to the next. 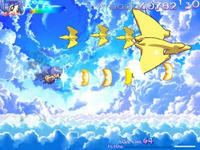 Sky Swimmer's Heaven is the new SHMUP by Solid Image, developer of Nomltest FS. In collaboration with Sound Impulse, they have crafted another great 3D shooter that showcases three different ships this time around. The EAT system makes a comeback, where enemy bullets that stay within your bluish square field will disappear after a certain period of time. The weapon system from Nomltest FS is here, together with the lock-on targeting missiles that was made popular by Ray Storm and Ray Crisis. The game is still in development, but rest assured that this would be another 'solid' hit when it is completed. In the meantime the test version is available to download from the site. Twin Seeds is a shooter from Japan that plays a lot like one of the Shanghai Alice series. Graphics may not be as polished, but the gameplay is. Bullet scratching system is the main attraction here. 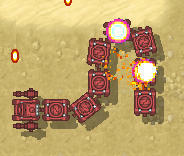 By staying close to enemy bullets for a few seconds, all harmful projectiles in your field can be turned into bonuses. Collect these to upgrade your weapon system. There's an option to adjust the difficulty level, making the game accessible for beginners as well as shmup veterans. 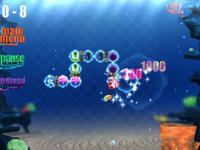 Octopuzzler is basically a dominoes game that uses animated sea creatures to replace dots from the original. You have to arrange the tiles so that the end of one tile matches the other. 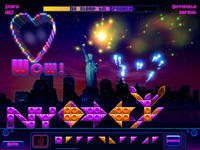 Features 100 levels and two game play modes. Thunder Heaven is another Thunder Force clone by Sojiro that reuses sprites from the classic Technosoft shooter. Just about all the weapons and upgrades are there, with the selectable speed setting intact as well. Unfortunately, the game does not have a difficulty level option to choose from. 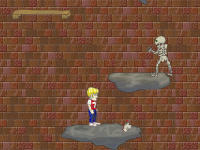 To Hell with Johnny is an action game that has you jumping off platform after platform in your quest to save Brianne. Timing is important here as Johnny will fall all the way down if he jumps off a platform too soon. Too slow and the debris will get him. Pretty good effort for a game made in 72 hours. Download it from this page. 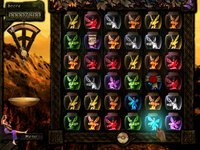 Dungeon Scroll Gold Edition is an update of the popular word game by Robinson Technologies. 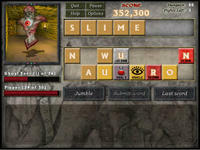 Create words from a rack of letters to cast spells and eliminate monsters. Longer words cause more damage. Think fast, because the enemy will continue to attack you while you think up of more combination of words. Earn rewards such as spell upgrades and extra health. 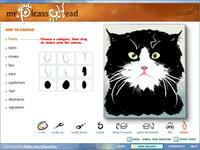 A nice little application to create avatars for use in your favourite forums, Create-a-face is just the thing for you. Enough options and variations to entertain and save you the hassle of drawing one using MS Paint. Mr. Picassohead is an interesting little application that you can use to draw a caricature of yourself or anyone you know. There's a showcase of submitted entries by other users that you can view in the galleries as well. 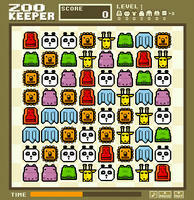 In Zoo Keeper, you basically swap tiles around to make matches of three or more. Remove a certain number of tiles as stated on the top right of the screen to proceed to the next level. You have to sit through an ad before being allowed to play. Minor hassle since the game itself is worth the wait. Will win you over with it's simplicity and cute graphics. Definitely a keeper! Ork Attack is a great remake of an old Amiga game, where you control a valiant knight on his quest to rid the land of evil Orks. 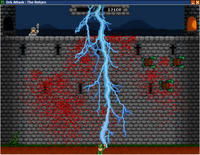 The bad guys will attempt to climb the castle, so you need to drop rocks on their head to kill them off. Froggy Castle 2 is basically a remake of the classic Pang, where you shoot projectiles to burst bubbles into tiny little fragments. The bubbles have been replaced with inflated frogs, however. 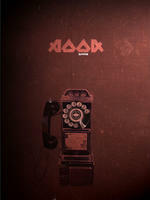 AOOA is an adventure game made by Michael Clague that has a very unique setting. In it, you have to use an antique phone to travel from one destination to another by dialing a 3-digit number. Solving each puzzle will reveal a code for the next location. StrangeBanana is an interesting little application that generates a different page layout for every visit. Made using ASP.NET, you can even use any of the random designs as templates for your own web site. 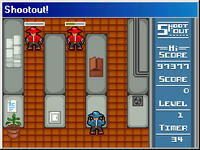 Shootout is a surprisingly fun mini-game coded by Jimbob, where you have to shoot as many bad guys as possible within a given time limit. Additional time can be earned by reaching the end of each level. 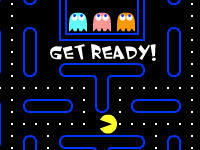 Paul Neave has a great Pac-Man remake on his site that is playable using any Flash-enabled browser. 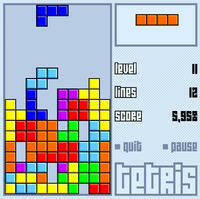 A well-made Tetris clone by Paul Neave can be found on the Neave Games web site. Runs on any flash-enabled browser. Rock It is actually based on a mini game from one of the Sonic Advance titles. Most of us know about the rock-paper-scissors rule, so there's only the need to learn the controls to this game. Just use the arrow keys to move around the three cards available, and activate them using the space bar. If you match the correct cards, they will disappear. 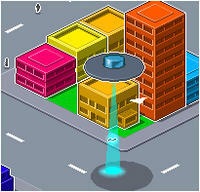 In Saucer City, you control a flying saucer hovering over the city's population and capturing them using your ship's gravity beam. The simple graphics looks great and fits the theme, while the game itself is pretty fun for an hour or two. The Eo Game Development Community is a gathering of developers who are skilled in the ways of coding using the Game Maker engine. To be considered for a membership, the individual must go through a rigorous selection process and have a proven track record in independent game development. Click on the Play tab to access the downloads section. It's something like a Hall of Fame showcase for creative works made using Game Maker. Retrobattle is another original title from Daniel Remar that could possibly have made it big if it was released for the NES, back when the console reigned supreme. You play a galactic police named Captain Good, on a quest to retrieve lost cargo and brave vicious aliens along the way. An excuse to enjoy some classic platforming goodness. 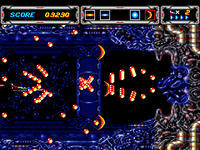 Just collect eight coins in each level to proceed to the next. Your objective in BLOX Forever is to slide colored blocks to match and remove them from the playing area. This is a 10 level playable demo of the downloadable version. All sorts of devious contraptions are placed strategically in an attempt to thwart your efforts. Nano Pipeline is a nice little Zuma clone that tries to do a few things differently. For example, you can't use the right mouse button to swap colored objects between shots. Instead, holding it down will move your ship in that direction. The mini-games are pretty decent too. There's a connect game, solitaire, the common sliding puzzler and a mahjong variant as well. Five games in one package. In Gem Shop, you basically slide rows of gems to create jewelry for your customers. Match three gems or more of the same color to build up your daily sales and earnings. Memory Loop by Dekovir Entertainment has a setup that is very similar to Zuma but plays slightly different compared to that bestseller. Your task is to overturn the objects two at a time and try to find as many matching sets as possible before they reach the gate. Basically a memory game, although this one is a little more difficult since the objects move around and there's a time limit working against you. 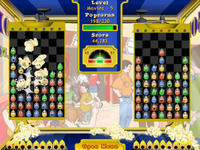 Super Popcorn Machine is a decent click-fest for trigger happy fans. Pop the colored kernels by clicking on them. You have to alternate between two containers to keep them balanced. Fireworks Extravaganza is the new title from KatGames that has you picking up gems to fill shapes that occupy the playing area. Fireworks are launched for each shape cleared. Plays a lot like the Inlay series from Puzzle Labs. Jaywalker is a great game by dessgeega that will test your reflexes and speed of thought. 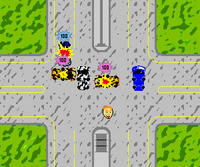 You control the disembodied head of a character named Marjorie, as she attempts to cause as many car crashes as possible at a busy road intersection. Game ends if Marjorie is hit by a car. Jump in front of a car at the right moment to cause it to swerve and crash into either the pathwalk, traffic poles or other cars. Chain car crashes for bonus points. Space Intruders is another clone of the classic, although in this one the aliens will come at you from all four corners of space. Basically your quest is to protect the mother brain from overwhelming enemy forces. The nasty little critters will spawn if you leave them on screen for too long. 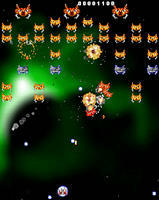 Revenge of the Robot Cats From Mars is a great Galaxian clone that introduces some new elements as well to update the classic gameplay. Destroying enemies will cause them to drop coins, which can be collected to purchase power-ups. Mimizu Panzer is basically a clone of Snake, with some Japanese shooter elements. In the game, you control a line of panzers that is practically invulnerable to enemy fire except for the leader of the pack. 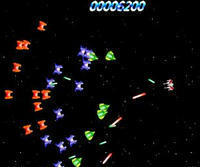 Blow up the enemy forces in each level to proceed to the next. You can charge up the panzers' flamethrowers by letting them get hit by enemy bullets, then proceeding to shoot them yourself to release a burst of flames. Hero is another brainchild of Daniel Remar that attempts to recreate the feeling of playing early console hits. Featuring two colors, six levels, eight MIDI songs, and some bonus features if you manage to beat the game. Plays a bit like Metroid. Castle of Elite is an excellent puzzle platformer by Daniel Remar that has the distinction of using both keyboard and mouse for controls. The game eases you in slowly with easy-to-follow tutorials for the first quarter of the adventure, offering hints as needed with the press of a key. 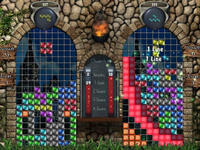 Pick up blocks resembling Tetris shapes and place them using the mouse to create new platforms. 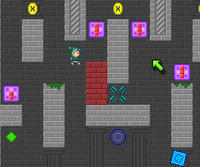 Beat devious traps and perform death-defying jumps. NES-related tributes and unlockables exist as well, making this a definite keeper. Dr. Doc is an excellent puzzle-oriented action game that has you collecting items to cure infected Fufflers in each level. Just pick up the fruits using the CTRL key and throw them into the machine to make potions. Use them to save the creatures. The only feature missing from this freeware is some background music. Submachine is another entry in the crowded "escape the room" genre. Well-made, won't stump most players too much and very little pixel hunting compared to other games with similar objectives. Only complaint is perhaps it's a tad short. 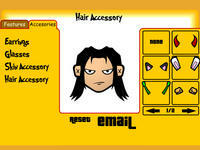 Plenty of other flash games on the site as well. Submachine walkthrough can be found under comments. Grow Cube Ver.0.1c is the latest game from Eyezmaze, where you attempt to click on items in the correct sequence to solve the puzzle. 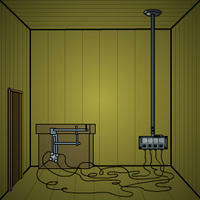 The Grow Cube walkthrough can be found under comments. Grow RPG and Grow ver. 3 solution can be found here. 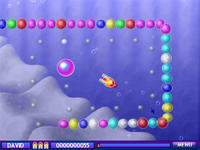 In No Friction, you control a rolling ball that has to collect green dots to open the exit portal of each level. The ball can only be sent rolling if it's sitting still, and it only stops when it hits a wall.